My route home at the end of my trip will have me on a 4-hour connection at Guangzhou airport in China. I've read online that it's an unpleasant airport but it would be more bearable if I knew I would have free Wi-Fi access and electricity there. 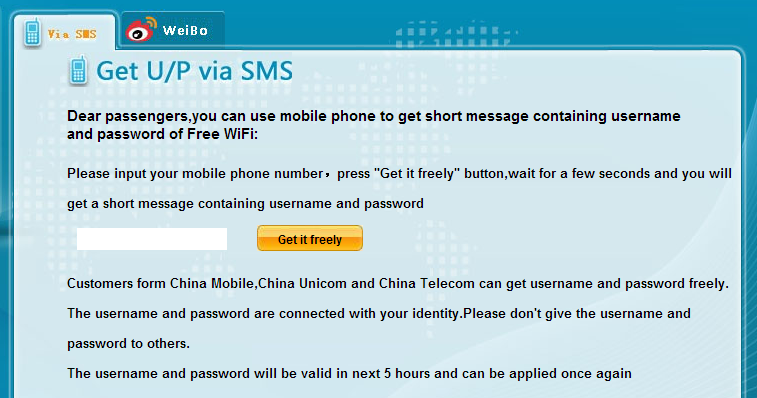 But a couple of the reviews mentioned the Wi-Fi had Chinese-only login, or that the English language link is broken. There is also mention that I might need a phone with a local SIM or an account on something I've never heard of. Has anyone here used it? Do I need anything special to log in? Does it now have a working English language option? Can any Chinese speaker here tell a poor 鬼子 how to log in to the Chinese interface? I had a similar question about Wifi in Astana Airport, and my solution in the end was to check Foursquare. It's popular among travellers, and people leave tips, so often they'll comment on the wifi (or lack thereof). In this case, I looked up Guangzhou on foursquare and it appears that several people have reported using free wifi at the Oak Tree Cafe in the airport. To me this infers two things - firstly, there's probably not an easy-access English airport-wide wifi (at least not free) (although as you've found, it might just be that it's hard to use and not in Latin script/broken) and secondly, that at least you can use the cafe's wifi. However you may need a map of the airport to clarify whether it's in the international terminal. 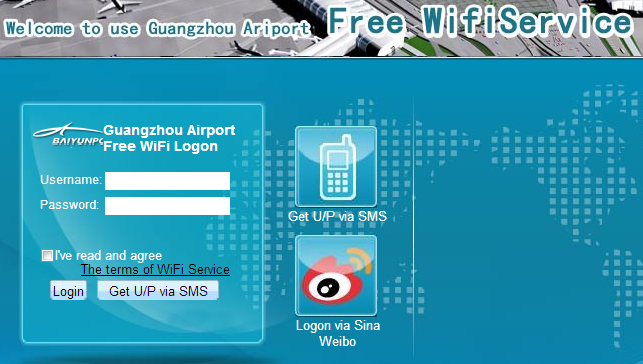 Well there is definitely free Wi-Fi at Guangzhou International Airport, including in locations that transit passengers can use. When I was in transit for four hours a few days ago I'd say about every second departure gate had an Internet point which included I think two electric sockets on either side. These were of course a bit crowded with people using and charging various devices. There were various other sockets around the place that took various shaped plugs, but all the ones I tried seemed to have their electric supply disabled leaving only those at the Internet points working. It turns out that to get a login you need a mobile phone or an account on some Chinese Internet service I'd never heard of called Sina Weibo. I'm a bit of a phone hater so I didn't understand some of the jargon but it seemed that only Chinese phone numbers would work, perhaps only certain carriers: China Mobile, China Unicorn, and China Telecom. As I had no telephone and no Sina Weibo account I spent my four hours without Internet at Guangzhou airport. From my friend that just flew back from France for studies, she is Chinese, using the Wi-Fi is easy and most coffee shops have it. The international side will likely have better coverage than the Chinese side. Just search for Wi-Fi, and the only thing you need to do is just ask for the Wi-Fi password. It is very easy, just say Wi-Fi or show them your login screen. Also from personal experience, I have never paid for Wi-Fi in China, nor do I know of anyone that has paid for it, unless it's 2/3g, which is not really Wi-Fi. Also, many airports have these poles that have computers around them and it will have Wi-Fi instructions, or if you are really worried, when you go into the airport, go to customer service and the women (I've only seen women working there) will inform you of how to access the internet at the airport. You have to buy a local sim card from a 'ripoff' seller (CNY 100 = AUD $22.) with virtually no credit on it. But it gives you the local number you have to enter to receive a Wi-Fi passcode. Any attempt to access the Wi-Fi will direct you to the official Wi-Fi webpage for registering. As mentioned earlier a number of coffee shops have free Wi-Fi. If you are a customer you can ask for the Wi-Fi password in the shop and access the internet during a meal. Yes a number of power points are damaged, because unusual plugs are squeezed in & cause the damage inside. If you are planning a trip consider the high speed railway (200 to 350 km/h) network which has a station in the underground of the airport. Even though this is an old question, let me write how it is now. I was there a few months before, and there are self-service KIOSK machines from where you can generate wifi user id and password, internet worked for a while and kept stopping. Most social networks don't work, installing VPN apps might be a smart decision. Not the answer you're looking for? Browse other questions tagged language-barrier wifi guangzhou can chinese-language or ask your own question. 5-7 hour layover in Guangzhou; Should I leave the airport and explore? Can I use Hong Kong dollars in Guangzhou? How can a non-Chinese-speaking traveller use the free Wi-Fi in 7-Elevens in Taiwan? Is it possible to use the free Wi-Fi at the Zurich Airport when one cannot receive a text message? Can a non-resident tourist buy a gun for use back in his country? Is it possible to use the free Wi-Fi at the Delhi Airport when one cannot receive a text message? Can I leave my bags somewhere in or near Guangzhou airport?